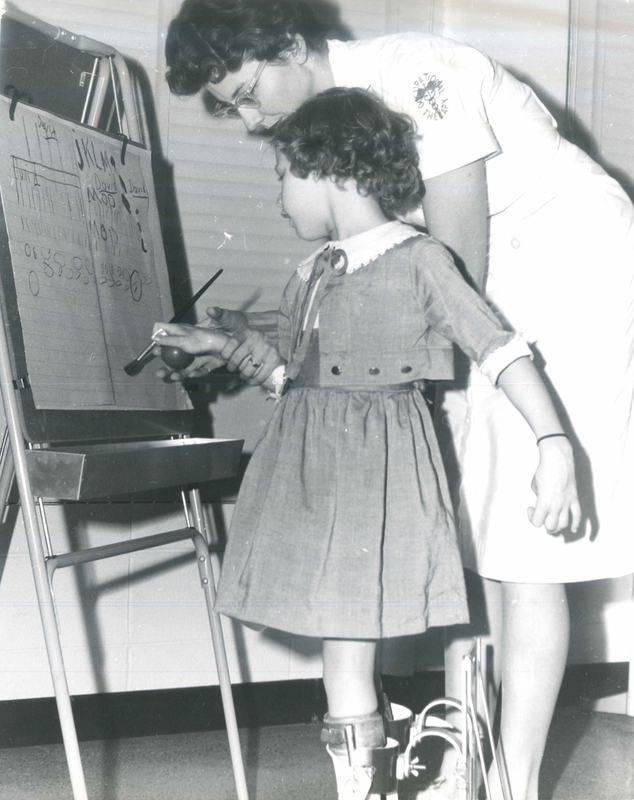 An occupational therapist helps a client with cerebral palsy practice handwriting. This photograph illustrates a mixed type cerebral palsy patient with components of ataxia and athetosis. She is beginning writing training by practicing basic circles and straight lines before attempting letters. The equipment shown is: an adjustable easel (work can be raised or lowered for standing or sitting use); standing stabilizers (to maintain balance and stability in standing while using upper extremities); and an adapted brush. The child grasps a rubber ball in a mass grasp pattern; the ball is mounted on a metal strip that holds the brush. This may be slipped onto the brush so that it can be changed for right or left hand use.